Fort Huachuca is a neighborhood like no other. With a history extending back to the Indian Wars of the 1870s, this still-active U.S. Army base located just 15 miles north of the Mexican border in southern Arizona is a study in contrasts. Census figures from 2010 placed the military population at about 6,500, with approximately 7,400 family members. It is completely contained within the boundaries of Sierra Vista in Cochise County, which annexed the fort in 1971. Many of Sierra Vista’s residents work on base as civilian employees. 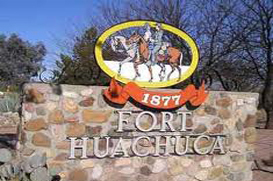 Nearly half of Sierra Vista’s population is employed by the government, and Fort Huachuca is the largest single employer. There is a mystique about this military installation; its history is long and varied. Once the home of the 10th Cavalry, known as the Buffalo Soldiers, the fort has been an active training ground from 1913 through the present day, with only a few years “off duty.” Its land was deeded to the Arizona Game and Fish Department following World War II, but that the transfer was revoked when the Korean conflict broke out. It was once briefly an air base, and the Sierra Vista Municipal Airport share a runway with the Army Air Field. During NASA’s shuttle flights, Fort Huachuca was designated as an alternate shuttle landing site, although it was never used as such. Today, it is the home of NETCOM/the 9th Signal Command, and the U.S. Army Intelligence Center. There are several additional advanced technology units and missions headquartered at Fort Huachuca, including the Military Auxiliary Radio System (MARS) and a radar-equipped aerostat, maintained by the Drug Enforcement Administration by Lockheed Martin. On-post housing is available for military families, and it is extensive; more than 1,900 housing units are available for families, with more than 1,700 available units for enlisted service members. Elementary and middle schools are located on base and daycare facilities are available for military children. High school age students attend the Sierra Vista High School with local students. Military families have the option of renting apartments and homes in nearby communities, including Sierra Vista and North Huachuca, or of buying homes off base. Prices range from approximately $800 to $1,100 for rentals and from $100,000 to $160,000 for single-family homes. Military advisers will assist families to make the decision upon arrival, and temporary housing is available for families waiting for permanent housing. Nearby Raymond W. Bliss Army Health Center is one of the best. Two chapels on base provide many denominational services, and there are several chaplains always on hand. Because the base is so large, there is a wide variety of off-duty activities on the base, from sports and active training facilities to clubs and special interest groups. In addition, Fort Huachuca’s location near Tucson is an advantage, with nearby mountains, canyons, wildlife refuges, caverns and hiking trails to offer ample leisure time possibilities.